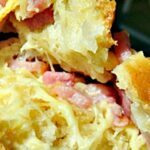 Bacon and Cheese Soft Rolls. 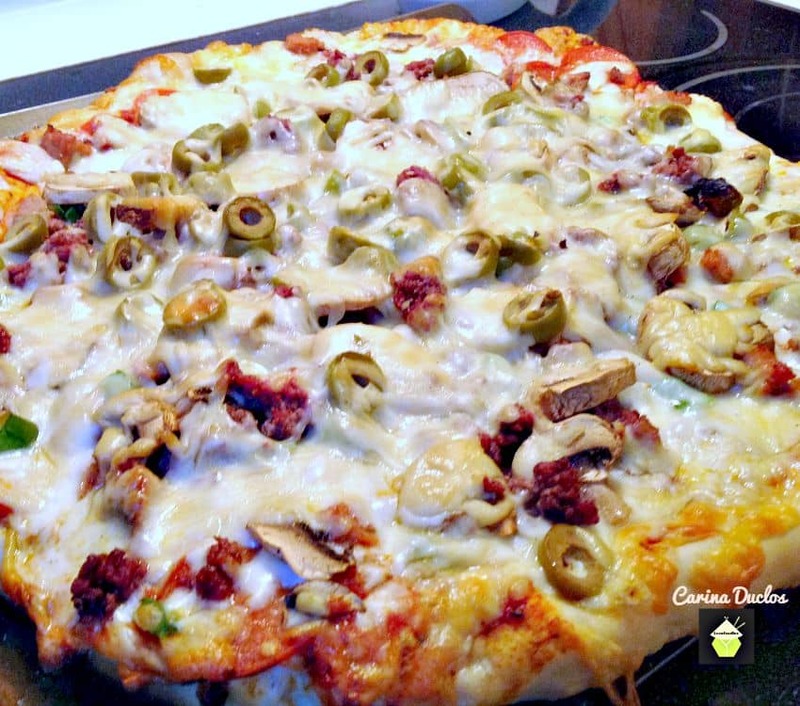 Super delicious when eaten fresh from the oven when the cheese is melting! 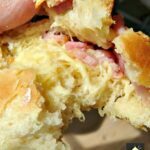 Bacon and Cheese Soft Rolls. 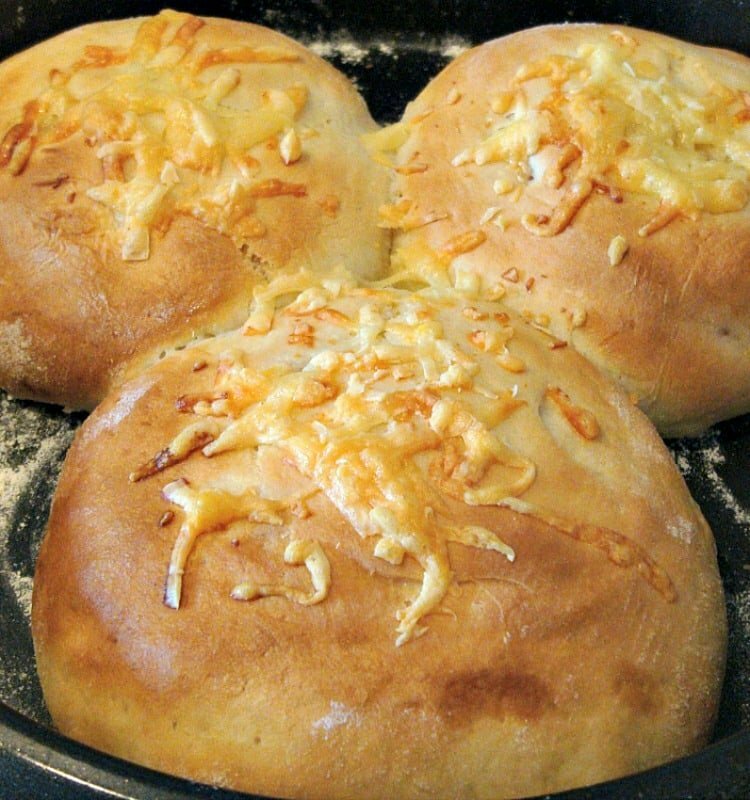 This recipe came about from when I made Simone’s Soft Bread Rolls. 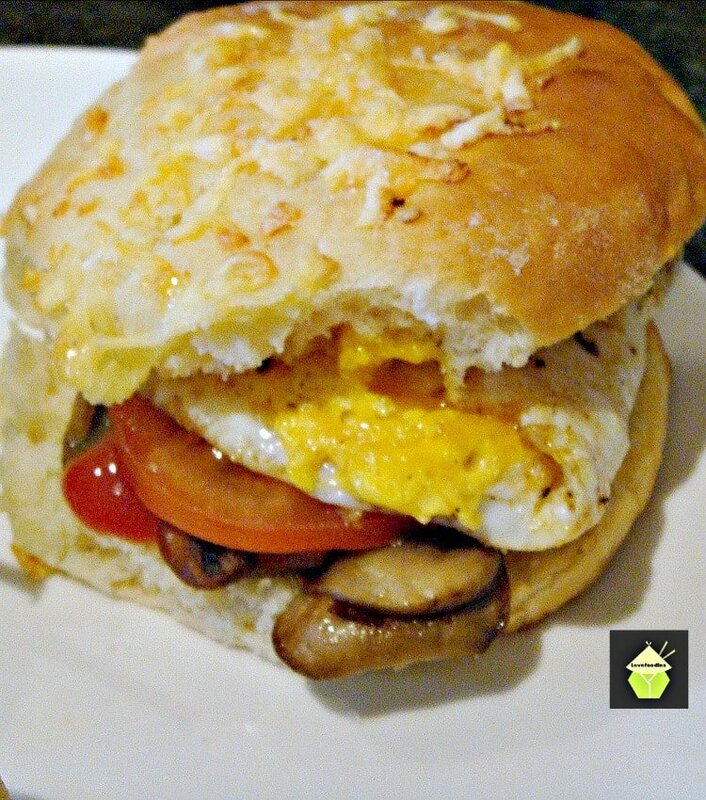 Those rolls were so soft and delicious I thought about adding a filling and seeing if it would work…..and yes! 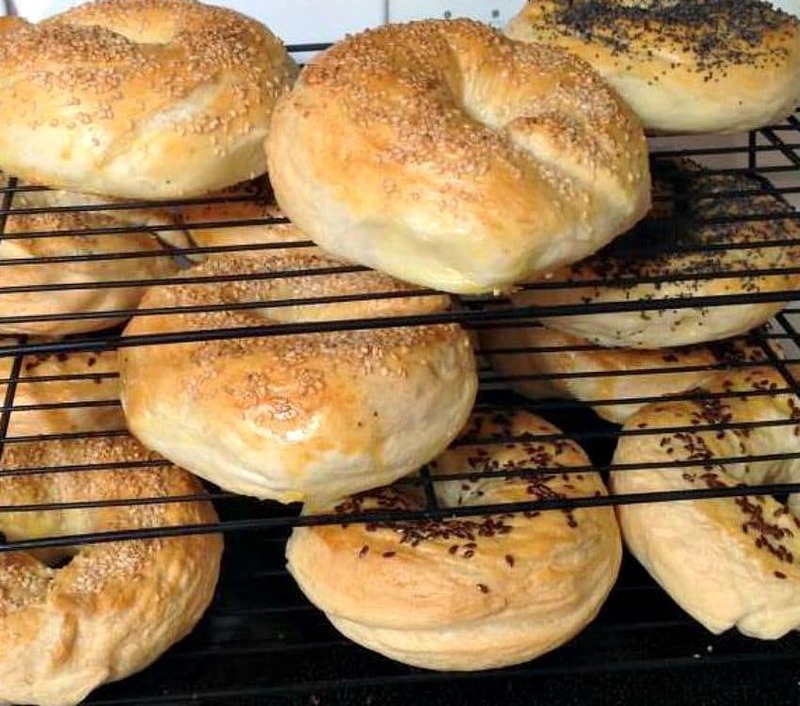 I created a lovely soft bread roll, sticking with Simone’s original recipe, and adding the extra filling and some photos to show you how easy it is to make. 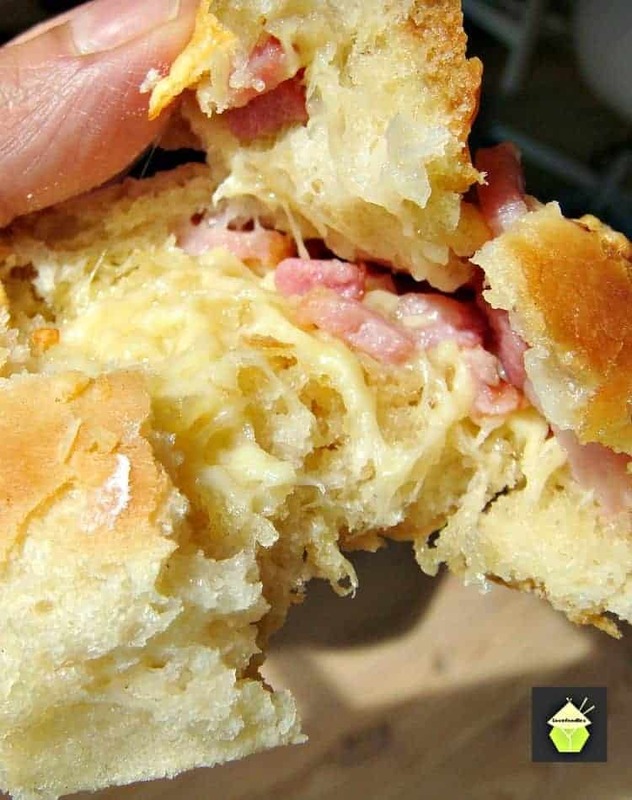 These bacon and cheese soft rolls are freezer friendly. That means you can easily make a batch, freeze ahead for say parties, picnics, lunch boxes and just get out what you need. You can eat them defrosted at room temperature or reheat in the oven so the cheese is all melty again! 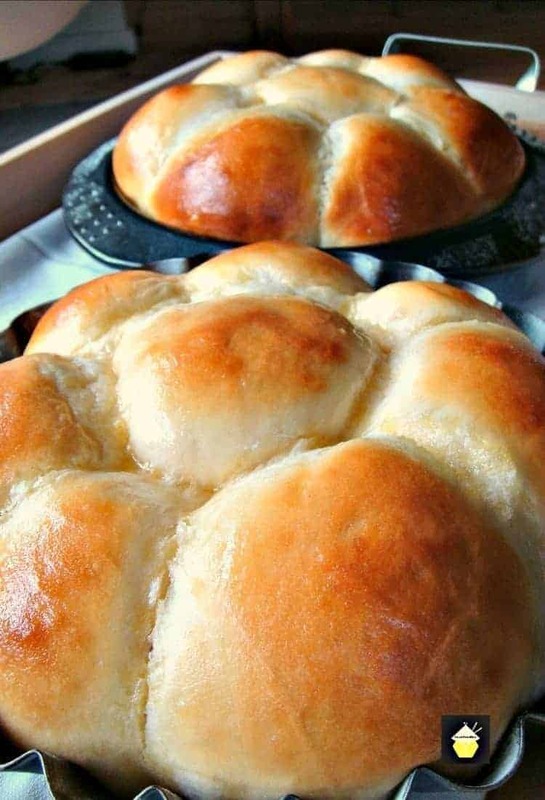 I have used a dough mixer to make these rolls, but if you don’t have one, please don’t worry! You can make these by hand. At the end of this recipe you can see a link to go to the mini video tutorial for How To Knead, Rise and Shape Dough By Hand. It’s easy to follow and fun to watch! *** I have given the filling & topping measures PER ROLL in case you want to make a variety of fillings etc, so you can judge better. 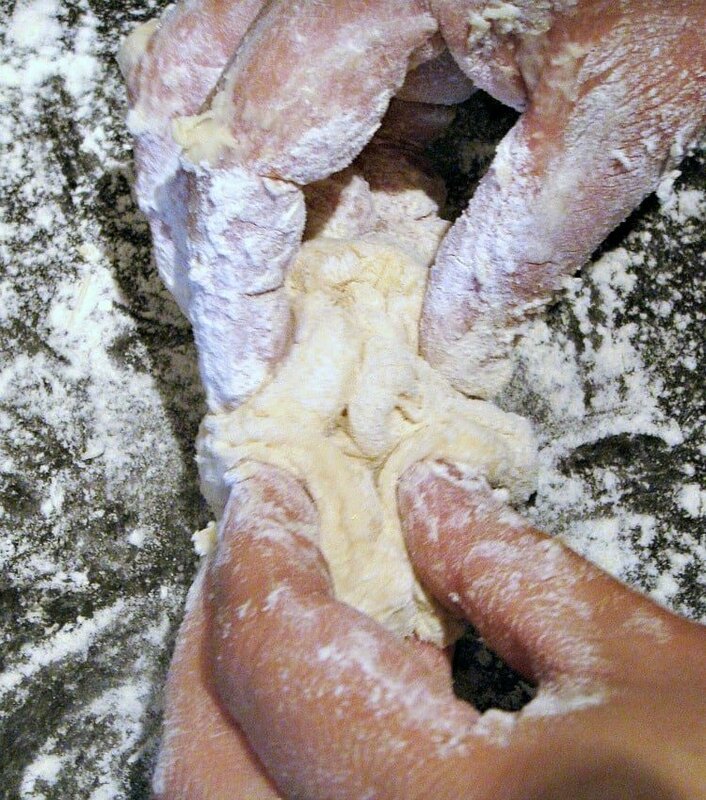 You will need extra flour for your work top & hands when you come to handle the dough. 1. 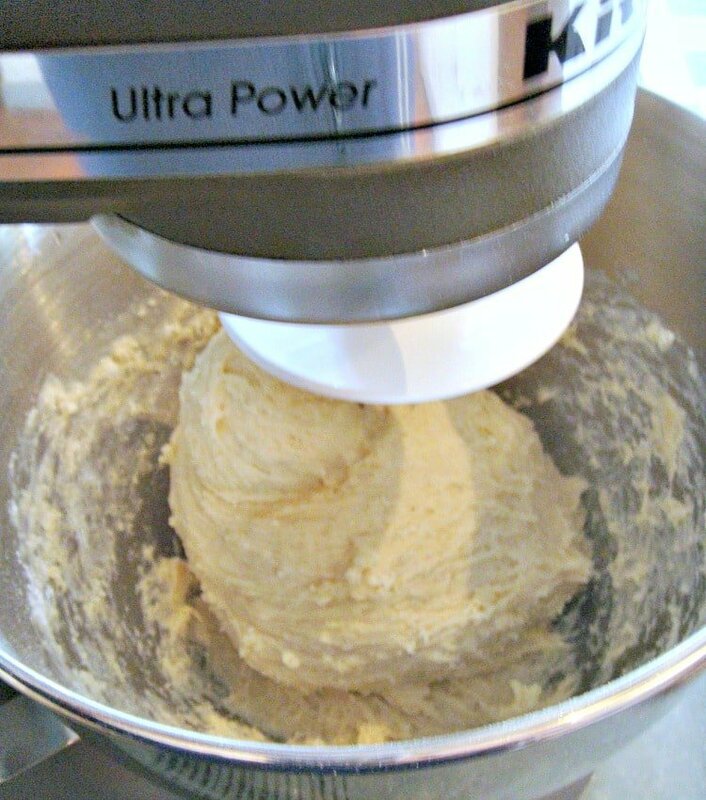 First we get the bread ready: Combine first 4 ingredients in the bowl of the mixer and wait 20 minutes. The mixture will become foamy. Look how it has risen! 4. 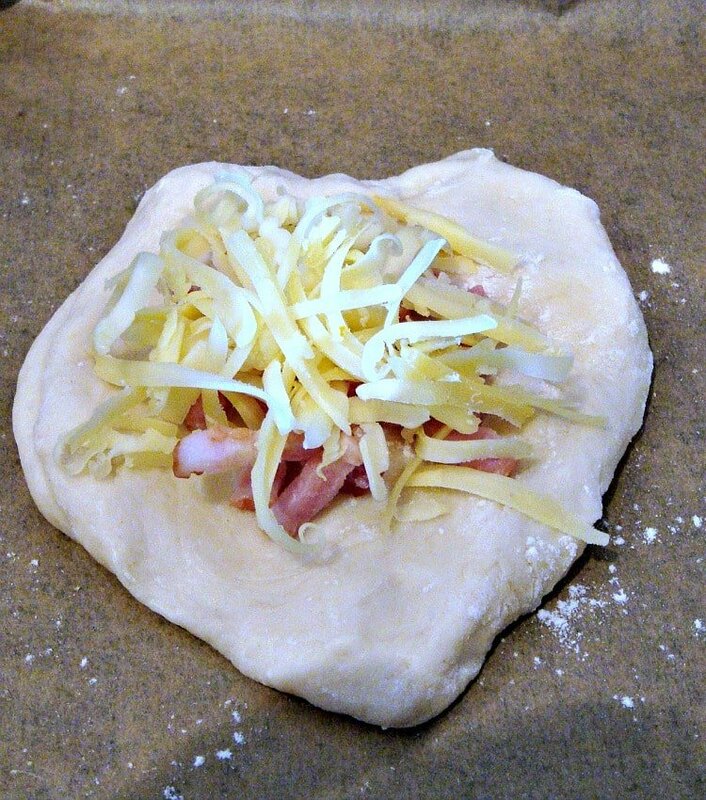 Whilst rising, make up the filling (fry off bacon & drain & grate cheese) and allow to cool. 5. 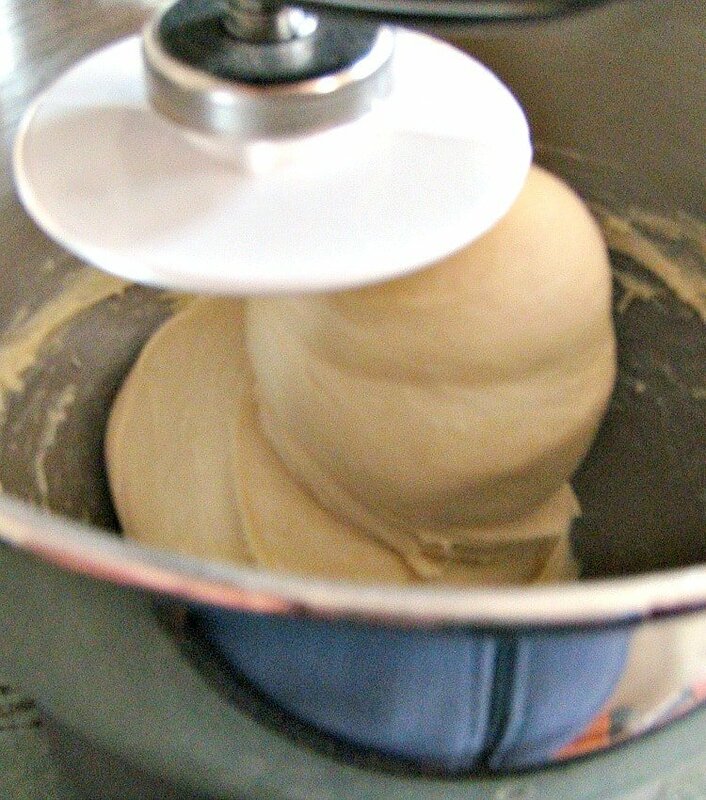 Once it has doubled, flour your hands very well and also the work top, and pull off pieces of the dough, slightly smaller than a tennis ball. 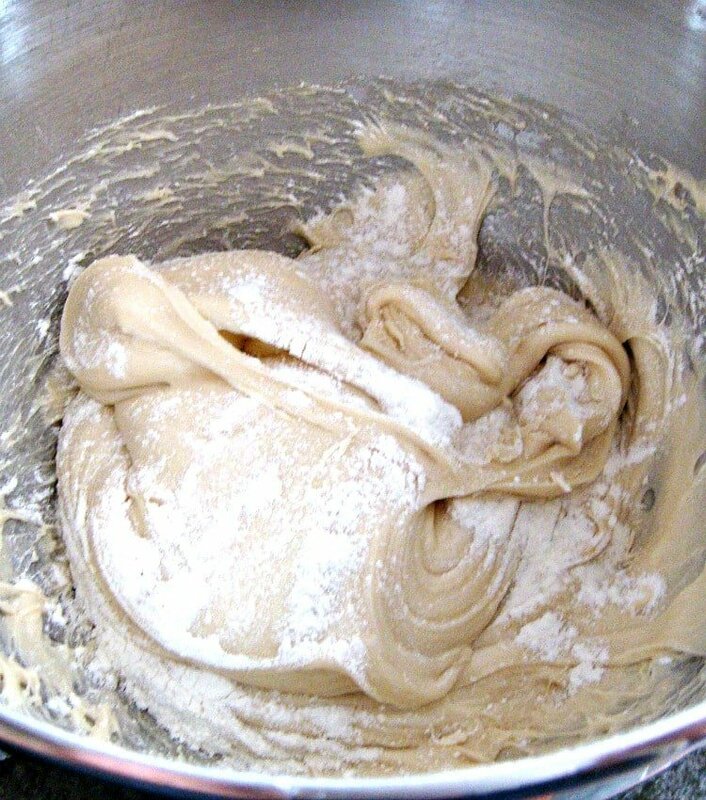 Don’t be frightened to add some flour if your dough is very sticky. It will be fine. 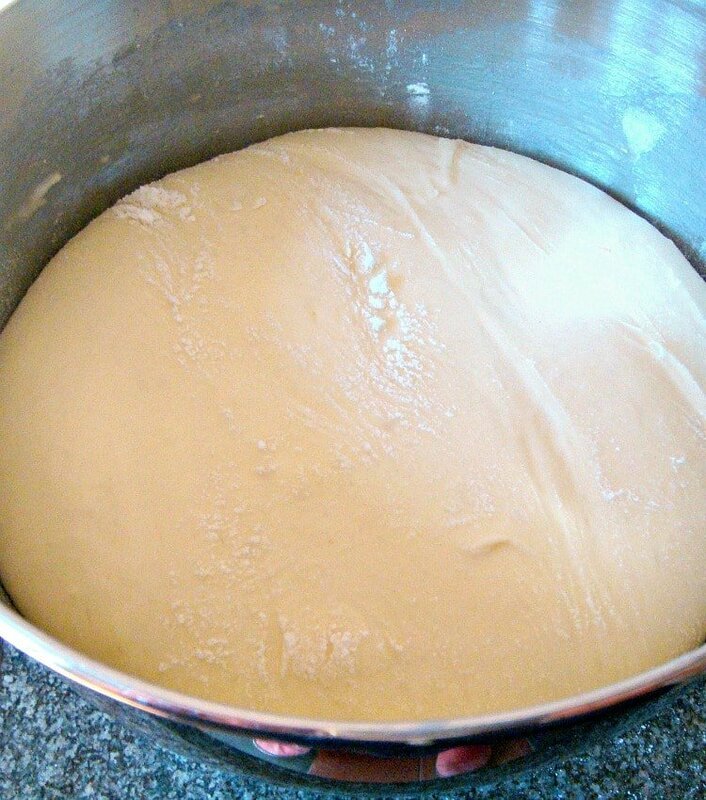 Place your piece of dough on the work top and flatten as in the picture. Add a heaped teaspoon of filling in the center. 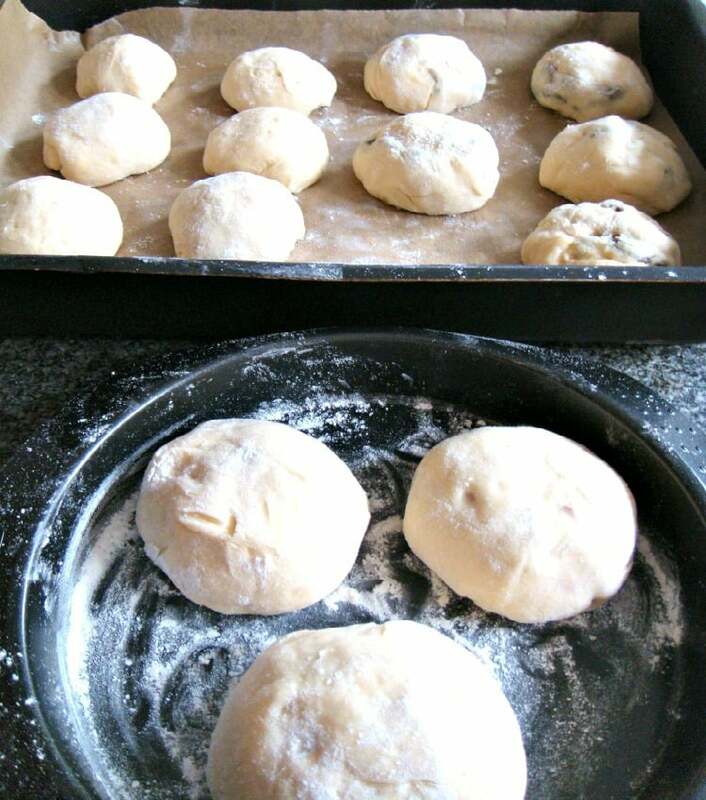 Pull the dough from the sides to enclose the filling and squash the edges together so they are sealed, and reshape if necessary into a roll shape. Turn upside down (so the seal is on the bottom of the tray). 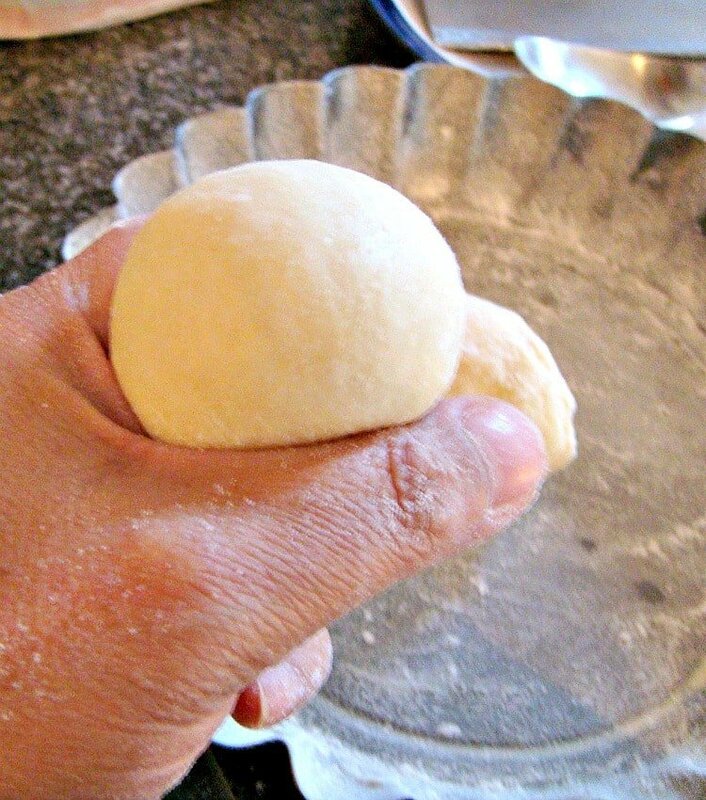 When you come to make balls with the dough, have a bowl of flour close by to dust your hands making it easier to handle. Be generous and make sure your hands are well dusted! 8. Bake at 400 F / 200C / Gas 6 for 20-30 minutes (until golden brown). Eat warm or cold. I love them when they are still warm! 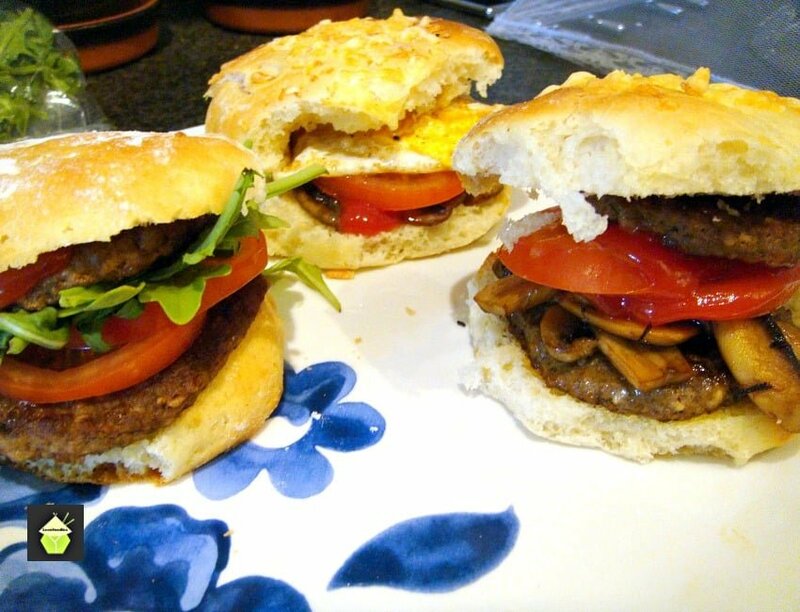 Below shows a photo of a variety of burgers I made using these rolls, from fried egg, tomato and mushroom, burger, tomato and mushroom, and arugula. All were very delicious! 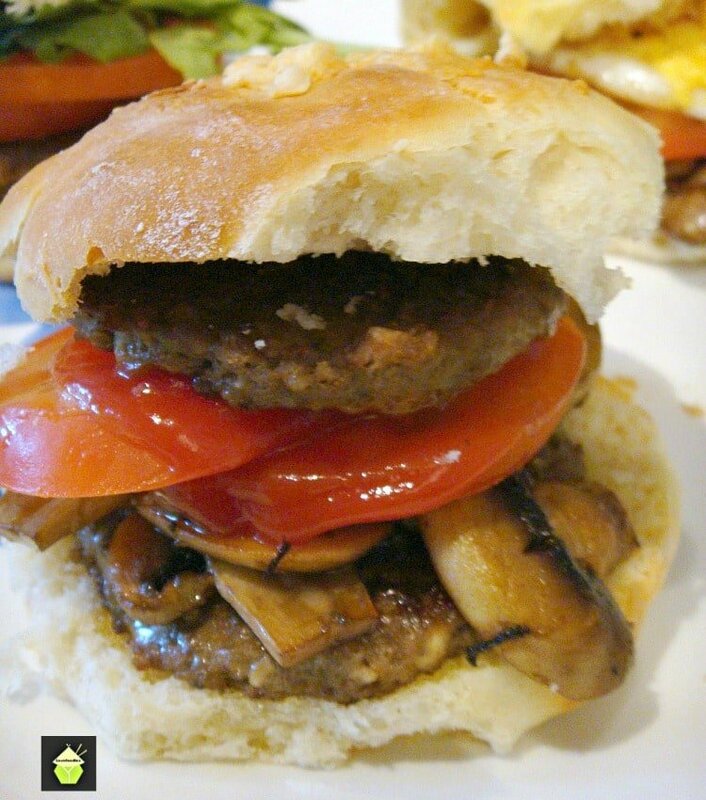 You can eat these rolls as they are, or cut in half and add a burger too! The one below doesn’t have any cheese because I have someone in the family who doesn’t like cheese so I made a couple without, and just added the bacon in the filling before baking the rolls! If you would like to learn how to Knead, Rise and Shape Dough by hand I have a short video tutorial which will help you with the technique. It’s fun to watch! Click the photo and we’ll take you right there! 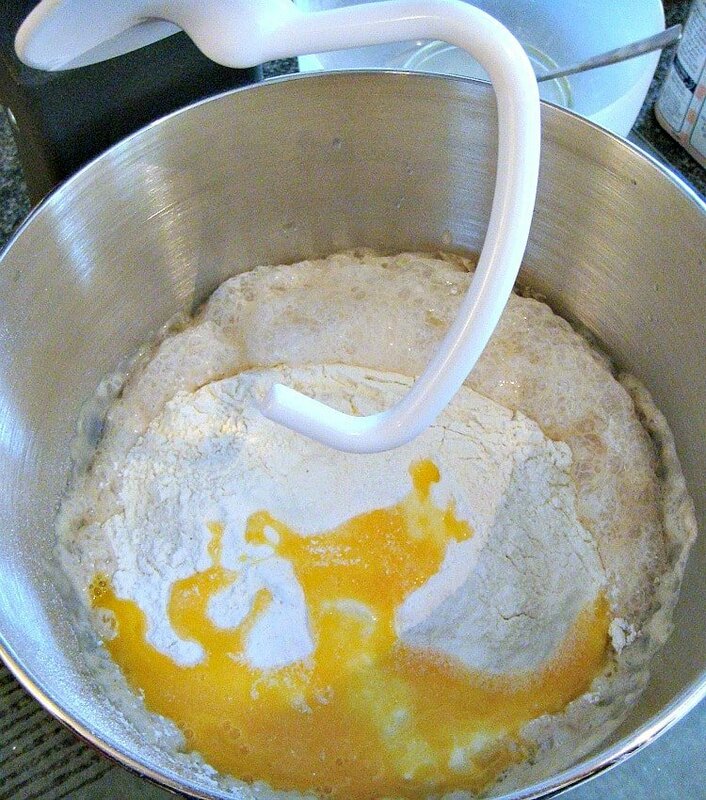 First we get the bread ready: Combine first 4 ingredients in the bowl of the mixer and wait 20 minutes. The mixture will become foamy. 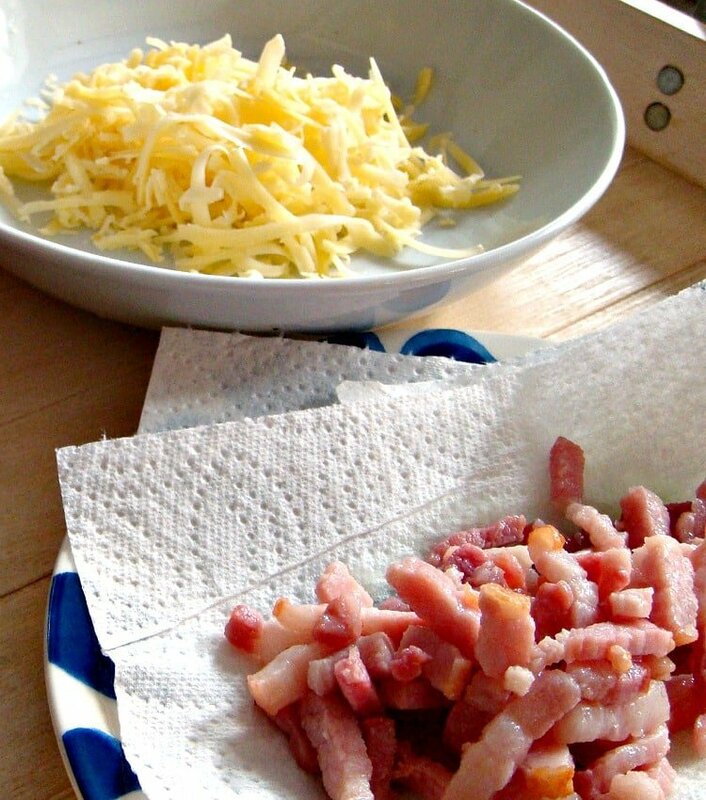 Whilst rising, make up the filling (fry off bacon & drain & grate cheese) and allow to cool. 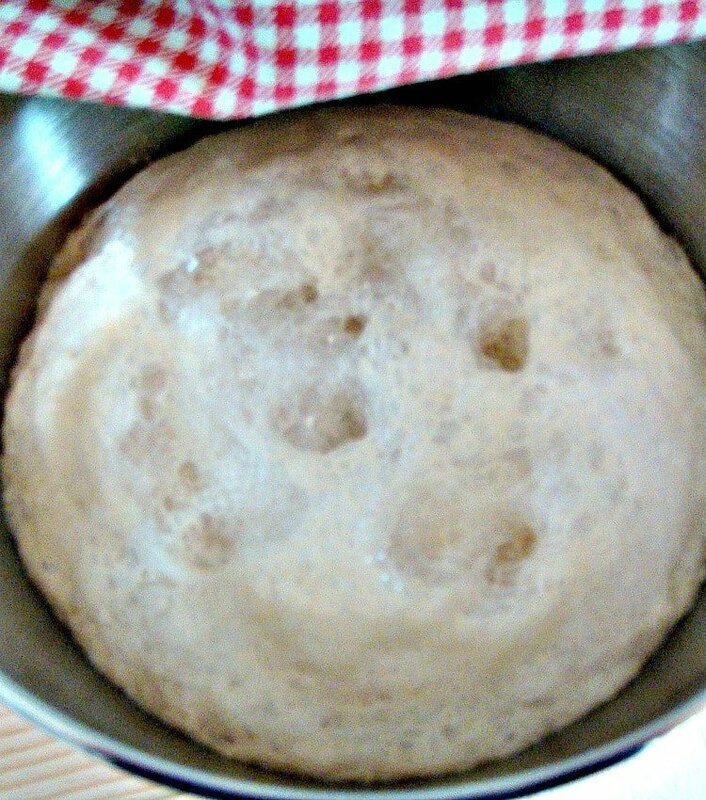 Once it has doubled, flour your hands very well and also the work top, and pull off pieces of the dough, slightly smaller than a tennis ball. 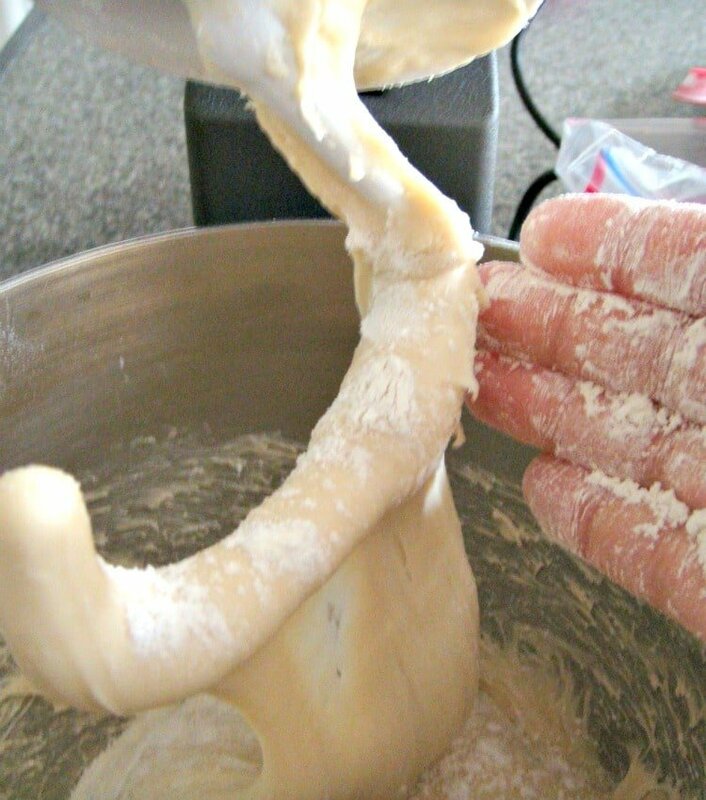 Don't be frightened to add some flour if your dough is very sticky. It will be fine. 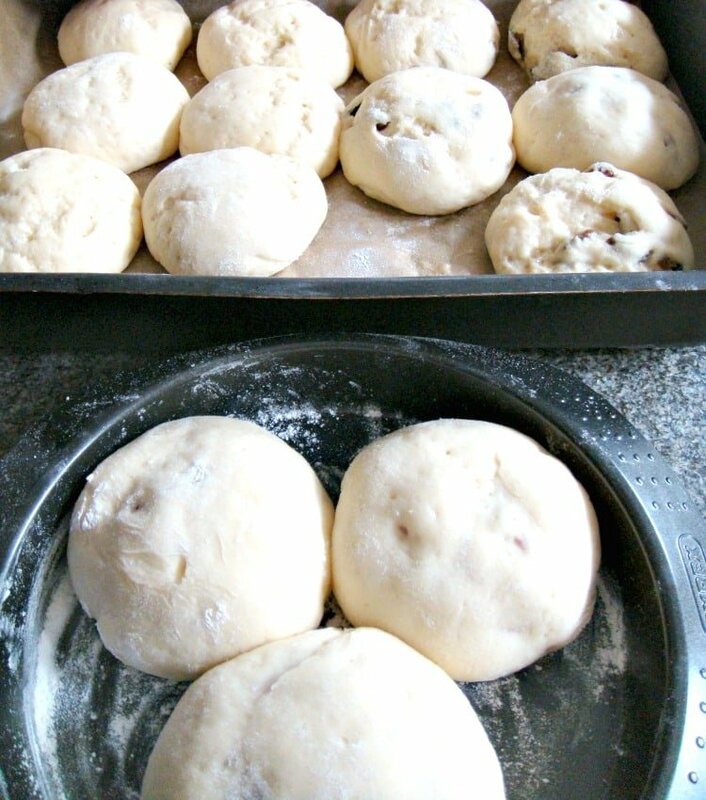 Place your piece of dough on the work top and flatten as in the picture. Add a heaped teaspoon of filling in the center. 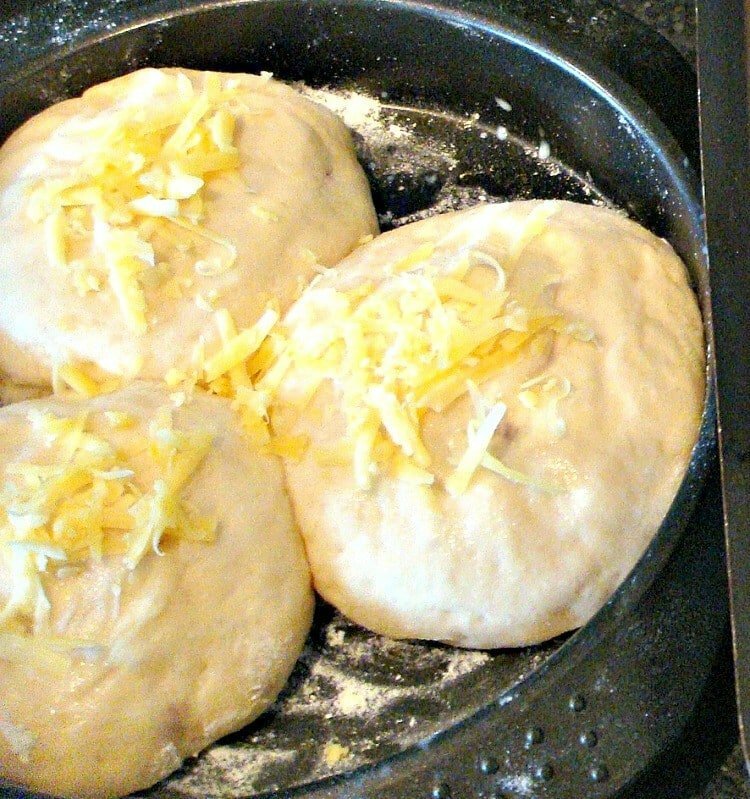 Pull the dough from the sides to enclose the filling and squash the edges together so they are sealed, and reshape if necessary into a roll shape. Turn upside down (so the seal is on the bottom of the tray). Bake at 400 F / 200C / Gas 6 for 20-30 minutes (until golden brown). Hi Irena, I use dry yeast. Please enjoy! Hi Charmaine, glad you enjoyed the recipe and the fish filling sounds lovely! It is indeed 3 tablespoons. It seems a lot but it really does make them beyond fluffy!! Thanks a lot the best soft rolls with great instructions and I shared it with my friend and she had a good result and was happy with it. I see you used thick cut bacon. Can these be frozen before they are baked, then taken out to thaw? How long would you give to thaw? Hi Charlie, yes, these can be frozen, I suggest defrosting at room temperature for a few hours or more, depending on what temperature your house is. Obviously if you live in a warm area then it won’t take as long. Hope that helps! To freeze before baking, do I shaped the dough with filling and let rise before putting into the freezer? Do I need to wrap each bun separately for purpose of freezing? Hi there, I would suggest you cook them and then freeze. Simply warm up in the oven when you want to serve. These rolls are really light and fluffy so I would worry you loose the air if freezing before baking. Hope that helps!